We’ve all been there, settling into the pew and hearing that a visiting priest would be speaking to us about the missions. My personal favorite was the priest from Africa who informed us that, if ever attacked by a lion, simply grab its tongue and it won’t bite you. While it is unlikely the opportunity will arise, I still thought it was interesting information. Being a wealthy and generous nation, we Americans are frequently called upon to aid those in need throughout the world. Every October parishes in the United States take up the collection for World Mission Sunday. The next time we are called to assist the missions, it might be good to recall when we ourselves were mission territory, when Catholics around the world dug deep into their pockets to assist the American mission. In the 19th century, numerous mission-aid societies were founded in Europe that benefitted American Catholics. The three largest were located in France, Austria, and Bavaria. Between 1822 and 1922, these three alone contributed almost $8 million to Catholic organizations in the United States. The first was the French Society for the Propagation of the Faith, founded in Lyons in 1822. It originated through the efforts of Pauline Jaricot, a young woman who was worried about the lack of faith in her own native country. She believed that the church could be renewed through the missions. Pauline started to gather small groups of people to pray daily and make small weekly offerings for the missions. Two-thirds of the first collection went to the United States and the rest to China. An early gift to the United States was the establishment of its first Catholic seminary. John Carroll went to England to be consecrated the first American bishop on August 15, 1790. While there, a representative of the pope put him in touch with a member of the Sulpicans, a French religious order dedicated to seminary education. Suffering persecution during the French Revolution, the Sulpicians were looking for a place to continue their ministry. Carroll recruited them and in 1791 established St. Mary’s Seminary in Baltimore. The Sulpicians provided the money, faculty and the first students for the new school. In 1793, one of their students, Stephen Badin, became the first priest ordained in the United States. Belgium also assisted American Catholics in the area of seminary education. Fr. Peter Kindekens, a Belgian-born priest from the Diocese of Detroit, visited his native land looking for help. He obtained 50,000 francs from the Count Felix de Mèrode to establish a college to both train foreign priests and American seminarians for the missions in the United States. The highly regarded University of Louvain was selected as the location for the new school. The American College at Louvain opened in 1857. Within 50 years it had supplied the United States with nearly 700 priests. Only two years later another institution was founded in Europe to assist in the training of American priests, the North American College in Rome, founded by Pope Pius IX. The Congregation of the Propagation of the Faith purchased for the new school a former Dominican and Visitation Convent, the Casa Santa Maria, located in central Rome near the Trevi Fountain. Twelve American students arrived in 1859 to reside there while attending the pontifical universities in Rome. Help came from all over for various projects in the United States. An example of this is the construction of St. Joseph’s Cathedral in Buffalo, New York. In 1849, two years after becoming Buffalo’s first bishop, John Timon went to Europe to study its beautiful cathedrals and raise money for his own. In Rome, Pope Pius IX personally gave $2,000, the Congregation for the Propagation of the Faith contributed another $4,000 and he raised $8000 more from other European donors. Bishop Timon also secured a large supply of sacred vessels and vestments from sympathetic priests and friends. This first European trip netted $14,000 or about 10 percent of the projected costs. Before becoming bishop, Timon served in Texas and had many contacts in Mexico. 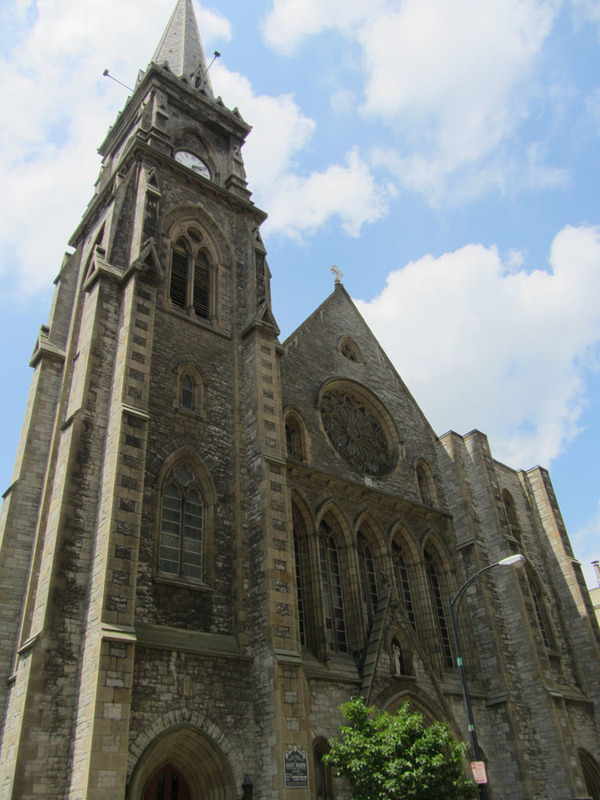 In 1853, the bishop went there to raise additional funds. Mexico’s Catholics were generous and Timon returned with $4,000 more for his cathedral. On a later trip to Europe, Bishop Timon pulled off an even more impressive feat with King Ludwig of Bavaria. The king loved the art of stained glass. He ordered three great glass windows portraying the Incarnation, Redemption and Resurrection to be made and these won first prize at an art exposition. Bishop Timon was struck by their beauty and had the nerve to tell the king that these windows should adorn the cathedral he was building in America. Ludwig at first burst into laughter at the audacious request, but Timon persisted and the king at last consented to donate them. In 1908, Pope Pius X removed the Catholic Church in the United States from the jurisdiction of the Congregation for the Propagation of the Faith. It was now no longer mission territory, having become a vibrant community of over 10 million and supporting numerous educational and service organizations. World Mission Sunday is a day set aside for Catholics to recommit themselves to the church's missionary activity through prayer and sacrifice. Annually, the collection in the United States raises about $18 million. (World Mission Sunday was celebrated on Oct. 20 this year, but donations can still be made online.) This money is combined with offerings from Catholics around the world and distributed to assist 1,100 mission dioceses. The money is used today for the same purposes that helped the American mission in the 19th century: catechetical programs, seminaries, religious communities, communication and transportation needs and the building of chapels and churches. When we were a young faith community struggling to get to our feet, we received help from our Catholic brothers and sisters. World Mission Sunday is a great opportunity for American Catholics to pay forward, so to speak, this generosity to the church’s future. Dennis A. Castillo is academic dean and professor of church history at Christ the King Seminary in East Aurora, N.Y.